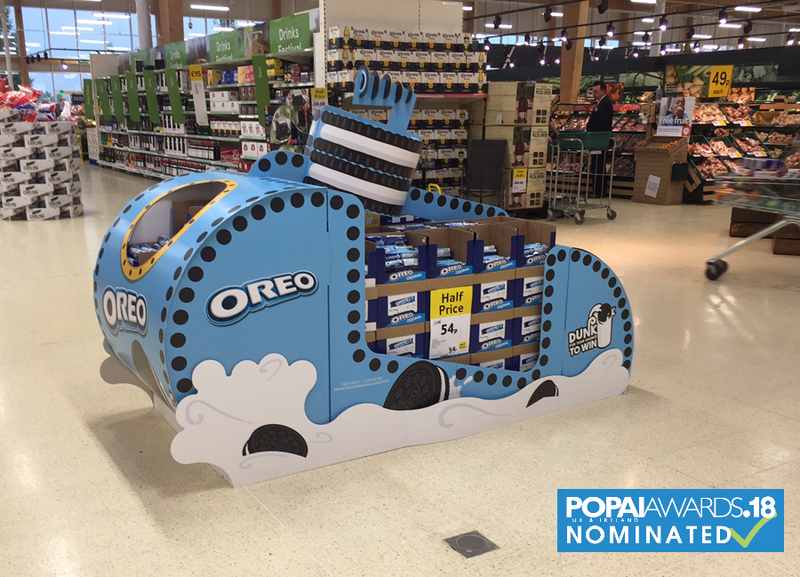 Whether our Oreo Cookie Submarine will win in October remains to be seen, there’s some really good competition. At this point we might wax lyrical about how “It’s the taking part that matters” and yes, it is but … we would still love to win! That aside, the biggest reason we are so pleased with this particular creative POP display piece is because of what it achieved. The brief was very specific as the client had been unable to gain new front of store retail positions in larger Tesco Extra stores, previously they simply had not been open to the brand. The unit needed to be strongly associated to an on-pack “Dunk and Win” activation promotion, and also communicate a retail offer in the store entrance area. The display was designed and developed specifically with the purpose of meeting the challenges of the open front of store position. Achieving a stand out design, strong first impression by the consumer and 360-degree ‘shopability’ were absolute ‘must have’s’ in this busy, high footfall area of the retail environment. The material used resulted in display construction that was sustainable, fully recyclable and had the ability to be disposed of through the retailers recycling partners. When Tesco were shown our concept and vision of how it would work, they loved it and went from allowing no Oreo front of store space, to agreeing to have the Field Sales team sell it in on a store by store basis. It opened up the potential from no stores at all to the list of Tesco’s entire flagship Extra stores. The display achieved a very high implementation success for both the brand and the retailers. Fingers crossed for the POPAI 18 Awards dinner in October. This entry was posted in Blog, News and tagged Awards, Cookies, Oreo, POPAI.